Amy’s Jason is inspired by Amy Johnson herself. The design is a tribute to her, her first aircraft ‘Jason’, and her flying career. 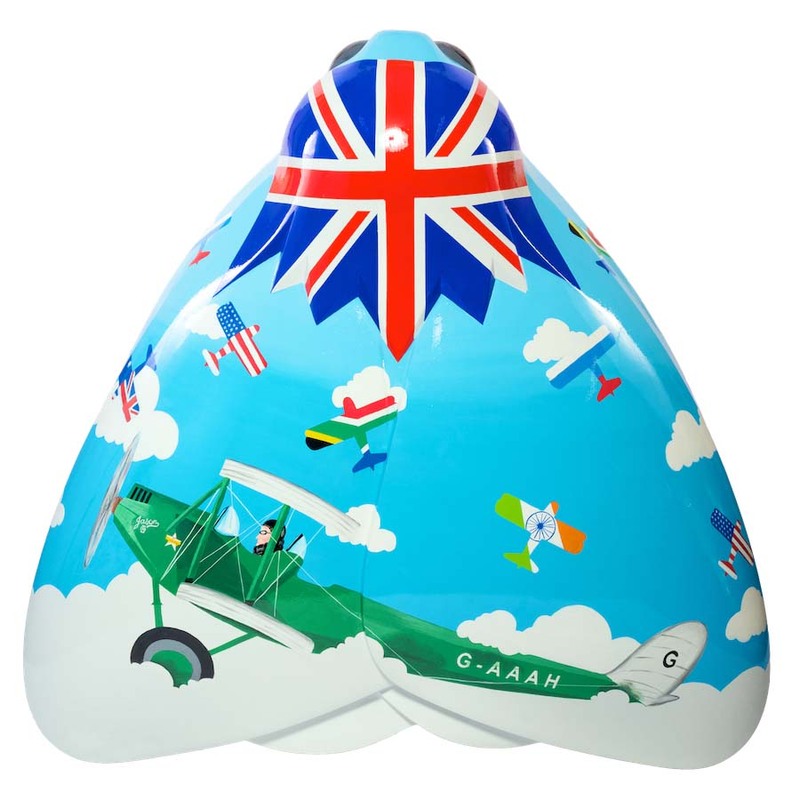 The different moths with different country flags represent some of the countries that Amy travelled during her flying career, with ‘Jason’ displayed at the forefront. Deven Bhurke is a Hampshire-based graphic designer and artist. His public artwork involves abstracts, geometrical patterns and fun loving characters. He was previously commissioned by GoGoRhinos in 2013, Bookbenches in London and Buses for Transport for London in 2014. In 2015 he was commissioned by several Wild in Art events such as the BigHoot in Birmingham, Barons in Lincoln and GoGoDragons in Norwich. He also created two Scrumpty sculptures for the Scrumpty Trail in Gloucester. Spencer Group is one of the UK’s largest privately owned multidisciplinary engineering businesses. It provides engineering solutions across the transport and infrastructure, energy and industrial sectors. The organisation has worked closely with the local youth development charity, CatZero to provide a support network for young people. It is now supporting the Amy Johnson festival to inspire young people to pursue careers in engineering and science.